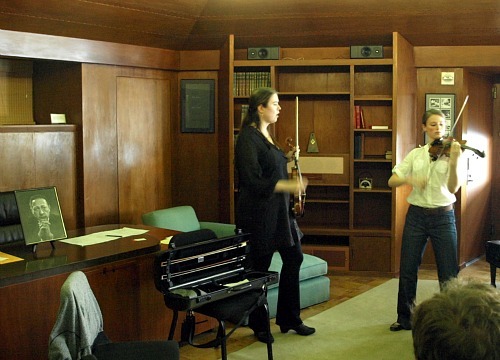 What could be better on a cool fall day in Los Angeles, than to sit by the fireplace in the Heifetz studio at the Colburn School and watch a masterclass with violinist Lara St. John? This weekend Lara will perform as the soloist in three concerts with the New West Symphony, giving the West-coast premiere of the first violin concerto by Australian composer Matthew Hindson. We know Lara from her funnest polka album ever and her Mozart collaboration with her brother, Scott, as well as the fact that she travels a lot with her fiddle when she plays all over the globe. With characteristic down-to-earth humor and modesty, she gave some great advice on Wednesday to three students, two who played the Tchaikovsky Violin Concerto (first movement, last movement) and one who played the first movement of the Brahms Violin Concerto. So get out your scores, we are going to get specific here! This was really the first time I'd sat in the Heifetz studio, now used by Robert Lipsett, who holds the Jascha Heifetz Distinguished Violin Chair at the Colburn School. Designed by Lloyd Wright, son of Frank Lloyd Wright, the hexagon-shaped room once sat in Heifetz's Beverly Hills back yard. After his death, it was dismantled piece-by-piece, held in a warehouse for many years, then re-assembled at Colburn. Kelsey played the first movement of the Tchaikovsky, with all those wicked passages and "unplayable" notes well in place. "Intonation is great, sound is great -- maybe have a bit more fun, now that everything is there," Lara said. The Tchaikovsky has so many notes, so much to focus on, but with the most difficult technical hurdles already jumped, one can try letting go and thinking only musically. Lara wanted the cadenza to keep its momentum, "You lost me there; it's too slow, too sweet and too beautiful for too long," she said. "It's kind of lovely, and I don't think it's supposed to be." There are also many chords, particularly in the cadenza, that can be played together instead of rolled. For example, the chords at the beginning of the cadenza: even the four-note chords can be played in unison, "think of only the middle strings." Another part of the cadenza has a double-stop descending chromatic run -- call it a "shake down," because it's like a backwards glissando (slide) with vibrato. The vibrato shakes the hand down the scale. I personally find it rather hard to do well. So here was Lara's idea for Kelsey, which I think would work for anyone here, maybe even me: "When you're pulling down," she said, "don't vibrate quite so fast. It's nice to hear all the half-steps going down." Her advice reminds me of advice about trills, that a slightly slower but audible trill sounds faster and better to the ear than a very fast but fuzzy one. She also suggested a neat trick she likes to do for the end of the cadenza, leading back into the orchestra part: trill to a B flat, then change to the B natural trill without changing bow. Change bow, instead, when the flute enters. I'd like to see that live! 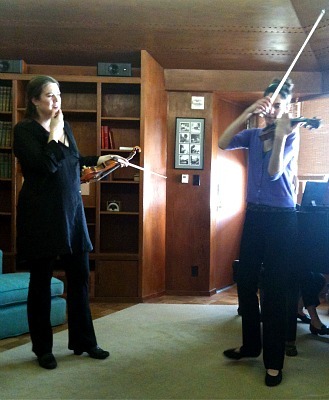 Lara works with Kelsey, while Heifetz seems to watch from his desk, left. "I have a personal vendetta against portato," Lara said. It does tend to be over-used, and the theme is a little more smooth and musical without it. More suggestions: make sure the middle of runs are audible, and that very high notes are high enough. For the double-stop triplets around m. 106, Lara suggested that the rests shouldn't be held very long, and in fact, one can even shorten the rests and make the orchestra chase you a little there because it's an exciting place where the music is building. I loved the way Lara demonstrated it, too -- with less resting and very fast triplets, it sounds a lot like the orchestra part. The first triplets can fast so that there is a contrast at m. 114, when one is asked to reign in the triplets and go "poco più lento." As the next student, Elicia, got ready to play the first movement of the Brahms Concerto, I glanced around again at the Heifetz Studio. There are no right angles in the room, which makes everything easy to hear. A violin is made from wood and so is much of this room -- 2,000-year-old Redwood, in fact, according to Lipsett. Heifetz memorabilia is everywhere: A proclamation for "Jascha Heifetz Day" from the City of LA hangs on the wall; an old-fashioned metronome sits on a shelf; a 1940s television hides in a cabinet and an old-school electric fan sits on the floor. A picture of Heifetz on the desk gives the impression that he is watching over all proceedings in the room. He sits with his hands folded, with one eyebrow raised. Okay. Play. The Brahms Concerto opens like a roller-coaster: a lot of stressful anticipation, then a big intense climb, and then -- coast. "This opening is so amazing -- when it really comes off, it's such a rush, " Lara said. One is required to coast in fives -- shall we call them quintuplet 16th notes? A little unusual. Lara wanted these notes to sound less measured, to be pulled more over the time. "It's rushing, but it's not a tempo thing, it's a feeling thing." She wanted her to ignore the piano and let the diminuendo happen on its own. "Don't you want a little more drama here?" Lara asked. Most halls will have a sound delay, so wait until the sound stops, so that the violin's solo entrance can be heard. "Just stand there a while. Wait until that 10-second delay happens." Then, all eyes and ears will be with you when you take it away. I'll be at Lara's concert with the New West Symphony on Saturday, maybe I'll see a few of you there. You'll hear from me afterward!